Make the 30th birthday of your elder sister a real distinctive event by bestowing her with this Enthralling Flourish Gerbera Collection and infuse all the more elating incense to her heart. 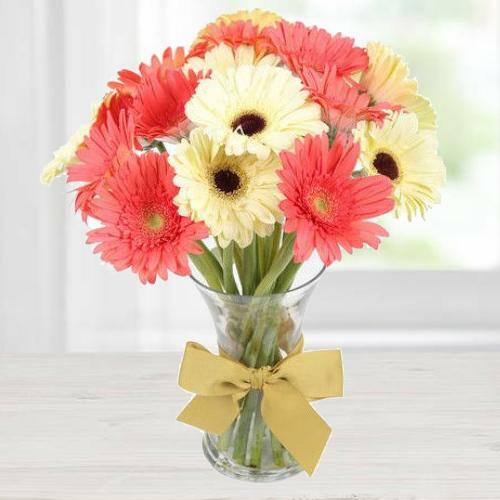 This Collection displays enchanting Gerberas of 12 White and Reddish Pink dyes sorted together in a chic Glass Vase that is enhanced by a trim Yellow Ribbon of Bow Shape. Express your deep-felt wishes to a mate of yours on a sincere success of the person through this gift of Enigmatic Freshness Gerbera Assemblage and heighten the bond of amity between you both. This Assemblage presents charming Gerberas of 18 Reddish Pink and White colour laid out in a nifty Glass Vase that is further embellished by a prim Bow-Shaped Yellow Ribbon.